What a wild book! It really milked my emotions, to the point where I almost couldn’t bear it anymore and had to stop listing for a while. But man it was good and that universe was amazing. As always, I do not give a synopsis of the book, you can find that elsewhere – this is my thoughts on the book. The Fifth Season is a story about oppression and abuse. It is a story about how a system can see it’s most powerful members of societies, either as people to be feared and oppressed or as leaders and how those choices shape society. The society of The Fifth Season, chooses the first option, but the series shows that the latter option is possible. Without that glimmer of hope, I do not think I could have read this. This is on the grim-dark end of the fantasy spectrum and right now I find that hard to take – with everything going on in the world. Part of the story shows how the regime dehumanize people, how those people actively dehumanize them self to stay part of the system – to not be thought of as too dangerous – to survive. It is really powerful. The story shows how this treatment breeds paranoia, but also how as an outcast group that paranoia is critical to survival. The regime (run by the oppressed them self – non the less) teaches the children not to show emotion – thereby making it easier for people around them to dehumanize them. The story deals with how oppressed people will often internalize the propaganda of their oppressors, come to see them self as the monsters they are made out to be. And it deals with what that does to them as people. All of the characters are deep and fully developed with flaws and strength and a rich sense of history – even the minor characters. The protagonist Sanza is a deeply flawed character, but so are everybody else around her. The story also have strong themes about family and about found families. All of the characters is deeply motivated by their loose of family and their thirst for family. I have written a long post on my thought on how this book deals with motherhood, if you want to read more on that theme. The book shows different kinds of relationship and families and they show them as valid. 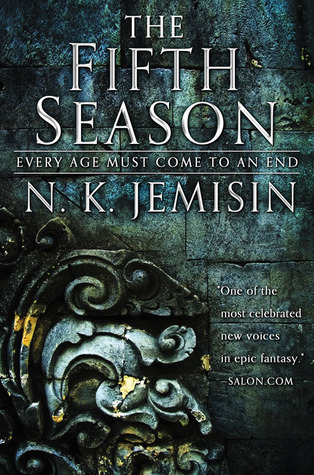 I love how Jemisin doesn’t shy away from any icky consequence of the world she has made and takes us there. Her world building is always all about social consequence rather than tech, but she world builds like a great sci-fi novel. This is the same kind of sci-fi/fantasy that the Pern book are, but much much darker. This is a post-apocalyptic fantasy novel – set very long after the apocalypse – or during a recurring one perhaps – as the societies are forced to continuously deal with their geological unstable planet trying to kill them. The story structure is also an interesting touch – it took me by surprise. But it really worked to tell the story – I am not sure it could have been told in a traditional way, without us hating the protagonists or wallowing in pity for them. So once again, this book is wild. I think I have to get my book club to read something of hers.